President Bush: Sure, I Care About Global Warming! "Sure, I love you, baby! Like I love Fresca!" President Bush assured the rest of the world today that he takes climate change seriously and vowed that the United States "will do its part" in crafting "a new international approach" to reduce the greenhouse gases that are warming the planet. However, he proposed no new initiatives to do so. Addressing a Washington conference of major economic powers, Bush said "the moment is now" to find a broad consensus on how to confront the challenge of climate change. "I want to get the job done," he told hundreds of envoys, lobbyists and activists. "We have identified a problem; let's go solve it together." His much-anticipated address, though, was more a defense of his own record on the issue than a concrete roadmap for future action. Bush said he wants to reach agreement with other heads of state by next summer on a long-term goal for reducing emissions, an accord that would allow different nations to decide how to meet targets. He touted technology as the ultimate solution, ignoring calls for mandatory limits on emissions. President Bush's refusal to embrace mandatory caps on greenhouse gas emissions has left him so far behind the debate on this issue, you can't even say he's siding with big business against environmentalists. That's because dozens of big businesses are endorsing mandatory cuts. The U.S. Climate Action Partnership includes Alcoa, DuPont, General Electric, General Motors, PepsiCo, and even oil companies like ConocoPhillips and Shell. President Bush's refusal to embrace mandatory cuts in the face of overwhelming scientific evidence and growing corporate support is simply inexplicable. I was lucky enough to be able to attend yesterday's Senate Environment and Public Works Committee hearing on how global warming will impact the Chesapeake Bay (I work for the National Wildlife Federation). Gov. 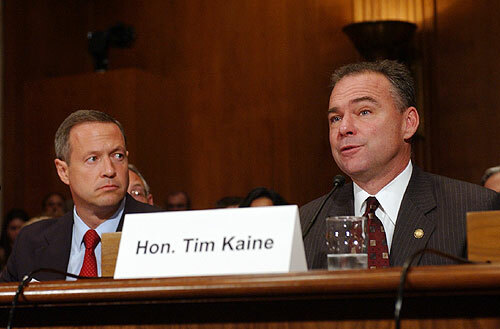 Tim Kaine and Sen. Jim Webb testified and Sen. John Warner sits on the committee. Virginia Gov. Timothy M. Kaine told a Senate committee that low-lying Hampton Roads is considered the second most vulnerable population center in the country to rising sea levels linked to global warming. Only New Orleans is more exposed, he said. "My message to you," Kaine told the Senate Committee on Environment and Public Works, "is that each day that legislative action is delayed will have negative consequences for the Chesapeake Bay." Also at the hearing, the NWF released a new report on how global warming will impact the Bay's fish and wildlife.When Kaine mentioned Virginia is a national leader in technology jobs, Sen. Warner said he hoped Virginia would soon be a national leader in "green collar" jobs -- producing low-carbon-emissions technologies. Neither Gov. Kaine nor I had heard the term, but we both had the same reaction -- excellent nickname for the industry! In addition, the morning featured a bit of political theater, with some fireworks between Sen. Barbara Boxer (D-CA) and America's leading climate change denier, Sen. James Inhofe (R-OK). You can read transcripts and watch video of the entire hearing at the Senate EPW Committee website. Conservation has transcended the “freeze in the dark” connotations of the 1970s and is becoming a vibrant and foundational part of our everyday lives! To further this exciting trend, join the “Community Conservation Conversation” featuring discussion among panel members and the audience. The key to a better and less consumptive society and economy is opening up the floodgates of conversation on this very important topic. The “Green Living Challenge,” developed by Arlingtonians for A Clean Environment, Arlington County’s Fresh AIRE Program and other conservation initiatives will also be highlighted. Panel members: Paul Ferguson, Chair, Arlington County Board; Monique Tilford, The Center for a New American Dream; Joan Kelsch, an Arlington County Environmental Planner; Drew Langsam, Turner Construction Company; Emily Curley, Alliance to Save Energy; and Martin Ogle, Northern Virginia Regional Park Authority. Congressman Jim Moran is also an invited panelist. This event is co-sponsored by 21 organizations. For more information, please call 703-528-5406 or e-mail Potomac Overlook Regional Park. I'm a member of the ThankYou Network site through my credit card, basically you get points every time you use your card and can redeem them for various stuff. Usually I stick to pretty boring rewards -- gift cards for Starbucks or whatever. But yesterday I was surfing around the site and noticed they have a new category of rewards -- "Eco-Friendly" products. They range from solar backpacks to carbon offsets to compact fluorescent light bulbs. 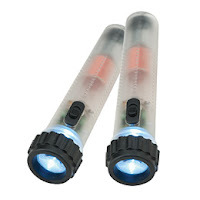 The Green Miles grabbed a pair of self-charging mini flashlights. They're known as Faraday flashlights, named after the man who invented the magnetic induction technology that powers them. The generators inside the flashlights use the same concept that powers huge electrical generators, just on a greatly-reduced scale. All you have to do is shake light backward and forward to create the energy source necessary to power it. Separately, I bought myself some reusable batteries and did the same for The Green Mom when I bought her a new digital camera for her birthday. All this was prompted by my shock and awe when I tried to buy four AA batteries for my camera while in California recently. Every place I looked was asking $4, but four rechargeable batteries with a charger is only about $20 -- and those are allegedly good for hundreds of charges. In this case, I'm doing the right thing for the environment by coincidence -- my financial interests and my climate consumerism are one and the same. After a lengthy public hearing, the board approved the application of EnviroCAB, a new company, to operate the all-hybrid fleet of 50 Toyota Prius and Ford Escape cabs. It also accepted the county manager's proposal to allow existing taxi companies to add 35 hybrids. [...] The hybrids will charge the same as standard vehicles. Please thank the board for allowing hybrid cabs to come to Arlington! As soon as enviroCAB gets up and running, I'll be sure to pass along their phone number. I live less than a block away from Ballston's Mosaic Park. Should be one of my favorite spots, right? In the three years I've lived here, I've used Mosaic Park twice. Maybe three times. Why? 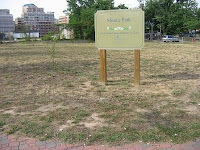 Mosaic Park is a lot closer to a parking lot than an actual park. Grass doesn't do well in DC's blistering summer sun unless it's watered, so the park is only green for parts of spring and fall. Without grass to slow the ball, you can't play soccer or toss a baseball -- in either case, any errant ball keeps rolling straight into traffic. Plain and simple, the park looks like no one cares about it. 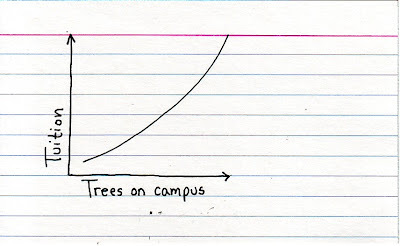 Small trees were planted but never watered, and at least half are now little more than vertical sticks. As you can see in the picture, litter accumulates around the edge of the park, especially cigarette butts. In the winter, the County doesn't bother shoveling the adjacent sidewalk. A jungle gym and small climbing wall were added to one end of the park a couple of years ago, so toddlers get some use out of that. But when we first moved in back in 2004, the Arlington Parks Department told us a basketball court would soon be going in. Since my roommate and I love to play (even though our combined vertical leap is approximately 13 inches), we were psyched. But 2004 came and went with no court, and in early 2005 we were told there was no money to build it. Now there's talk of the park being part of a huge mixed-use redevelopment of the neighboring Metro bus yard. Which would be cool, although Ballston's version of "mixed-use" tends to be "a boring rectangular condo or office tower with a Blimpee on the first floor." And a quick net search shows this isn't the first time a redevelopment of that spot has been planned. Others have fallen through before and so far, the sometimes-leaky bus yard remains. A little depressing? At least for The Green Miles' style? You're probably right. Let's balance it out with Mission Sqwerlpossible (via cuteoverload.com). (A)ny move to ban smoking in restaurants based on zoning will result in a quick trip to court and an equally quick defeat for the locality. Take that prediction to the bank. Alexandria's action in attempting to ban smoking was little more than a publicity stunt. If they were serious, city officials (and others who support smoke-free restaurants) would work to get legislation passed in Richmond. Problem B: A publicity stunt? During this year's legislative battle, a Survey USA poll showed a full 65% of Virginians supported a statewide bar and restaurant smoking ban. The number was even higher in Northern Virginia, where 70% of us back smoke-free legislation. Even 20% of smokers support a bar/restaurant ban. Problem C: The same Bob McDonnell who accepted contributions totalling $325,300 from the liquor and tobacco industry during his last campaign? That's who we should trust to issue objective rulings on the regulation of the tobacco industry? Just checking. Norfolk officials are ignoring a state attorney general's opinion and moving ahead in their effort to ban smoking in restaurants and bars. Attorney General Bob McDonnell says in an advisory opinion that a locality cannot impose smoking restrictions that are more stringent than those imposed by the state. But Norfolk City Attorney Bernard Pishko says the city is not relying on the Virginia Clean Indoor Air Act. Instead, it's relying on the city charter, which Pishko says permits smoking restrictions in two sections. One is through police powers ensuring the health and safety of citizens. The other is a provision giving the city power to order reductions in smoke and dust. Pishko says that latter provision may have been originally directed at smoke related to coal ... but it doesn't expressly state a specific kind of smoke. If it enacts a ban, Norfolk might face a lawsuit challenging its authority. But that's no reason for timidity. Given the haze enveloping the issue, a fight in court would bring welcome clarity, and perhaps even a popular and precedent-setting victory. Either way - lawsuit or not - Norfolk benefits from trying to clear the air. The bottom line? Legislators had their chance to respond to the will of the people (remember that 65% figure), but refused to ban smoking in bars and restaurants statewide or even to give communities the option to make their own decision. To see 2007's roll call vote on the smoking ban, click here. Now you have Alexandria and Norfolk in open rebellion. It's all especially bizarre because the local governments are being thwarted by the General Assembly's conservatives, who usually argue for local control. In the Republican party's battle of values versus Big Tobacco money, it's obvious what's winning out. Will the General Assembly correct its mistake? We'll find out in 2008. Reminder: Tell the County Board to Support enviroCAB! Tuesday night the Arlington County Board will take up the issue of new cab licenses, including enviroCAB's application to start a fleet made up entirely of hybrid taxis. Existing cab companies are expected to vigorously oppose enviroCAB, while Arlingtonians for a Clean Environment will speak in support of hybrid cabs. This is your last chance to tell board members you want to see as many hybrid cabs as possible on the streets of Arlington! Email board members here. You can read much more about enviroCAB and see a sample letter to the board in The Green Miles archives. The Green Miles has a new link! Now you can go to TheGreenMiles.net and it'll bounce you here to the blog. Thanks to What's Up Eric for suggesting it! The process was surprisingly easy. I just went to GoDaddy.com. TheGreenMiles.com is taken by what looks like a cyber-squatter, but I bought TheGreenMiles.net for something like $9. Once you've secured the domain, you can have GoDaddy redirect it to whatever site you'd like. If you have your own blog, I'd definitely recommend checking it out. No need to change your bookmarks or anything, TheGreenMiles.blogspot.com still works just fine. Monday, September 17, 7:00 to 8:00 p.m.
An overview of volunteer opportunities with ACE, the only group working exclusively on protecting Arlington’s environment. Learn about the following activities: leading service projects, board committees, newsletter writing, water stewardship teams, community wildlife habitat project, and more. Join us following the presentation for a social hour at a nearby restaurant. More information or register at volunteer@arlingtonenvironment.org or 703-228-6406. The time is here - Congress is finally making plans to tackle global warming. We need to make sure these plans coincide with what scientists say is necessary. Join your neighbors, from concerned citizens to volunteers within the civic, environmental and faith communities to find out how we can help Senator Webb and Senator Warner be leaders on this issue. Scientist have determined the US must cut global warming pollutants 80% by 2050 and say that we must act now to avoid the worst impacts of global warming. On September 18, 2007 find out how you can be part of this solution. Please RSVP by Monday, September 17, 2007 (w/ Veggie or Meat option) to mary@greencorps.org. Join fellow Mount Vernon Group members for free beer, a few games of pool, and good conversation! The Sierra Club and Beer happy hour will take place on September 18 from 7-9 pm at Carpool in Arlington. Carpool is located at 4000 Fairfax Drive. Visit Carpool's website for menus, directions and more. The Green Miles hopes to check out all three. Hope to see you around! I give up. I'm moving to Montreal so I can be there when global warming makes its weather more like Boston's is today. - Virginia will not stop burning coal for you or for anyone else. We also will not burn less. In fact, we'll actually burn even more. - Search the entire document and you will not find the words "mountaintop removal." Let's pretend it doesn't exist, mmmkay? - "Coastal energy production" sounds so much nicer than "drilling off Virginia's coast so we can have more oil to burn," doesn't it? - Massive taxpayer subsidies should be given to Dominion Virginia Power to build new nuclear power plants. - "Gov. Timothy M. Kaine unveiled long-range health-care and energy plans Wednesday that would slash the number of uninsured Virginians and dramatically reduce energy consumption." False. You'd think they could get through the first sentence without an inaccuracy, wouldn't you? Energy use would actually rise under the plan, just at a slower rate. It's right on page 8 of the report, Figure 1-8. - "One aspect of the plan calls for the state to reduce the energy it uses by 40 percent over the next decade." Still, in fact, false. The plan calls for reducing the rate of growth of energy use by 40 percent. Energy use would continue to rise. And page 20, the report calls for increasing in-state energy production by 20 percent over projected 2017 levels. Did the reporter even read the plan? - "Kaine (D) calls for a 30 percent reduction in greenhouse gas emissions by 2025." Sorta. That's one way of putting it. It's the way the press release put it, so why wouldn't the reporter reguritate it unchallenged, right? Another way of putting it is that Virginia will only reduce carbon emissions to 2000 levels. - "Virginia could become a leader in efforts to combat global warming if lawmakers embrace the plan." Batshit insane. The Republican governors of California and Florida have committed to cutting carbon emissions 20% off 1990 levels by 2050. They're the leaders. And under the Western Climate Initiative, Arizona, California, New Mexico, Oregon, and Washington have all already committed to steeper cuts than Kaine is even proposing (read the full plan), and that's before the Republican-controlled House of Delegates gets a chance to soften it up. But apparently the Virginia Conservation Network likes the plan. Which raises the question, how bad would the plan have to be for them to not like it? Where's a renewable portfolio standard? Where's cutting our greenhouse gas emissions 80% by 2050, the amount scientists say is needed to avoid the worst effects of global warming? Where's decoupling? A better plan comes from the Virginia Sierra Club, which has issued its Citizens Energy Plan. Let's hope the governor's paying attention. While in California for the Society of Environmental Journalists conference, I got to sneak up to San Francisco’s AT&T Park for a game between the Giants and Los Angeles Dodgers. It was a chance to catch up with some former Red Sox, including Dave Roberts, Grady Little, Derek Lowe (who is completely incapable of not acting like a goober in the dugout on days he’s not pitching), and of course, NOMAHHH. I’d heard Giants owner Peter Magowan has been making environmental upgrades to the ballpark, so I was excited to see them firsthand. The biggest and most important feature is the ring of solar panels around the park. The 590 panels are designed to produce about 120 kilowatts of electricity, roughly equivalent to 40 rooftop systems. From an aesthetic standpoint, they’re virtually imperceptible – they look like awnings (you may have to click to enlarge the picture just to see them, they're alongside the round lamps). In addition to producing energy, the ballpark has many features designed to save energy. It uses fluorescent lighting, motion sensor lighting and energy management systems. Its new scoreboard is said to use 78 percent less energy than the old scoreboard. The ballpark also features links to several public transit lines and extensive bicycle parking. And for the first time at any ballpark, I spotted recycling bins. They weren’t next to every trash can, but until other ballparks like Fenway Park or RFK Stadium include recycling bins at all, I won’t nitpick frequency. It’s always amazed me that people who are religious recyclers at home will throw away bottles at the ballpark without a second thought. In baseball terms, Americans recycle at home but not on the road. It’s one of the reasons our national plastic bottle recycling rate has tumbled from 39% in 1996 to 23% in 2005. So if you’re at a park that doesn’t recycle, should you spend innings four through seven harassing the park manager to recycle, missing two homers, a beanball, and a bench-clearing brawl in the process? No. When you get home, email the team to let them know you’d root root root for the home team even more if they recycled and used disposable dishware made of compostable materials like Greenware. If your favorite team is building a new park, urge them to make it a green building as the Washington Nationals and University of Minnesota are trying to do. And in case you missed it, read this fantastic article from Sports Illustrated on how some athletes, teams, and leagues are taking the first steps towards sustainability! Confusion reigned from the moment I handed my reusable grocery bag to the bagger at my local Harris Teeter recently. First she tried handing it to the customer who’d just checked out, thinking it was something they’d dropped. Then she just set it aside, clearly having no idea what it was, and started putting my groceries into standard plastic bags. Finally, the cashier turned to her and explained how the reusable bag worked. Incidents like that make me feel like the Johnny Appleseed of reusables, spreading the word about reusables whereever I go. And sure, that's cool, but on the other hand, it would be nice to sport reusables without having it be a major production. Granted, I’ve used my reusable bag many times at Harris Teeter with no problems, and it was obviously a new bagger, but the situation illustrates one of the sticking points as reusable items are introduced. Service employees have to be trained to use the new items, even if that training is only a quick explanation from the senior cashier. That training may come from the employer or the customer, but until employees more universally recognize reusables, it can make the process a pain in the neck for the customer. I got it filled with coffee at a shop in the airport, then on the plane, asked the flight attendant to fill it with soda. It had worked fine on the flight out, but just like the grocery bagger, this flight attendant was definitely unclear on the concept. She saw my mug and said, “Oh here, I’ll give you the cup of ice and the can of soda and you can fill it yourself.” She thought she was being helpful. Not so much. At that point, any hope of conserving a plastic cup had been lost, so I dumped the ice into my mug and gave the cup back to her, which she threw out. So instead of the usual two containers (plastic cup and soda can), we used three (cup, can, mug). This is progress? 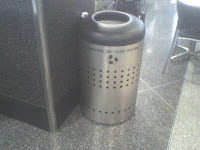 At least I was able to recycle the can in the terminal thanks to Dulles’ new recycling bins. If a product is a pain to use, people will stop using it. (I know, I missed my true calling in marketing, didn’t I?) It’s something we well-meaning conservationists need to keep in mind as we push reusables like grocery bags, coffee mugs, and water bottles. The early adopters should be prepared for minor hassles like the ones described above. But really, they’re minor inconveniences when you know you’re breaking the resource-container-landfill cycle, don’t you think? My trip to the Society of Environmental Journalists conference in California included a visit to the Monterey Bay Aquarium. The bay is home to a remarkable array of sea life, most notably marine mammals like whales, dolphins and seals. But the aquarium's signature species is the sea otter. There are five on display in a huge tank in the center of the aquarium, but the population fluctuates as otters are brought to the aquarium after being injured or orphaned, then returned to the wild. I was surprised at the size of the otters. Male sea otters can grow up to five feet long and weigh 100 pounds, about the size of a large dog. Most zoos I've been to have river otters, which are roughly cat-sized. ("I told you. Big suckers!" said The Green Girlfriend, a California native). Sea otters have the densest fur on the planet, and ironically enough, it almost led to their extinction. They were hunted relentlessly for centuries, cutting their numbers from a peak of as many as 300,000 to a low of as few as 1,000. The global population has rebounded, but are currently stuck at 15,000-20,000 worldwide, mainly along the Pacific, Alaskan, and Japanese coasts. Scientists are split on why sea otter populations are stuck in neutral, but a marine biologist told us he thinks whaling and overfishing is indirectly responsible. Because killer whales have fewer options, they're turning to sea otters for food. But on a basic level, the biologist told us, it's hard out here for a sea otter. Their population will never experience explosive growth because, to use an economic term, they live at the margin. Otters only entered the sea about three million years ago, a short period on an evolutionary scale, and they're still evolving the tools they need to be ocean-dwellers. Otters are barely scraping by on just enough food in water that's just warm enough with fur that's just thick enough to allow them to survive without a layer of blubber (insulating fat) to keep them from hypothermia. As I've told people I went to see the otters, the first question I've gotten has always been, "Did you get to watch them crack things open on their little tummies?" While I got to see the otters eat lunch, they were fed bits of scallops and squid -- no cracking necessary. I couldn't help but think of the South Park episode in which Cartman awakens in a future world ruled by super-intelligent otters who threaten him, "I shall smash your skull like a clam on my tummy!" For more on sea otters and efforts to help them thrive, click here! I've already installed power strips, helping cut my power bill 10%. And just recently, I went one step further environmentally, buying renewable energy. The Professor Farr segments are all worth watching, partly for the environmental tips, but mostly for the campy humor. It's vaguely reminiscent of the Jim "The Hammer" Shapiro commercials that kept us entertained back in my college days in Syracuse. The Green Miles is in Palo Alto, CA this week for the Society of Environmental Journalists conference, where my employer, the National Wildlife Federation, is a sponsor. Ironically enough, the conference is on the campus of Stanford University, which rejected The Green Miles as a potential student (gulp) 12 years ago. Fortunately Syracuse University welcomed The Green Miles as an Orangeman and the rest is history. I took Metro to West Falls Church this morning, then hopped on the Washington Flyer bus to Dulles Airport. I was reading the Washington Post on the bus, then looked to recycle part of it when I got to Dulles. 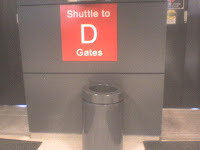 Unfortunately, when I got there I learned the waste management at Dulles amounted to a trash can. That's the best they can do? Considering I'd already brought my reusable coffee mug along for the cross-country trip, I was willing to carry my newspapers until I could find a recycling bin. Sure enough, at San Francisco Airport I found a recycling bin labeled "CONTENTS RECYCLED OFF SITE." That basically means instead of relying on us unreliable chuckleheads to drop recyclables in their correct containers, they pay their waste hauler to sort out the trash from the recyclable materials. Oh, and I just realized I have a photo of a recycling breakthrough at Reagan National Airport. Until recently, National didn't have any recycling at all, but as I was flying out in August, I noticed these new cardboard bins. In the DC area, the far-and-away leader in recycling is BWI Airport. Check out more details here. Want to know how to set up a recycling program at the airport in your community? Check out the EPA's website! I'm heading out of town for work for a few days, but I'll try to keep the blog updated while I'm on the road! Before I head to Dulles, I wanted to pass along a couple of really stunning climate stories that have gotten very little media attention. The annual average temperature in 2006 was 2.1 degrees F above the 20th Century average and marked the ninth consecutive year of above-normal U.S. temperatures. Each of the contiguous 48 states reported above-normal annual temperatures and, for the majority of states, 2006 ranked among the 10 hottest years since 1895. As if that wasn't shocking enough, now we have the twin powerhouses of Hurricanes Dean and Felix. Conservatives had been bragging that the until-now quiet hurricane season proved global warming must not be happening. This Jack Abramoff pal even went so far as to say, "A few more hurricanes seasons like these and Americans may begin clamoring for global warming." Its landfall marked the first time two hurricanes hit land at the topmost category in the same year since a storm was first reliably recorded at that intensity in 1928. Dean, this year's first hurricane, hit Mexico's Caribbean coast at category five on August 21. Its rampage through the Caribbean and Mexico left 30 people dead. For some reason, the fact that two category five hurricanes have made landfall in the same season for the first time in recorded history isn't seen as an important fact in most of the storm coverage I've read. For example, it's not mentioned until the 24th paragraph of this story on the Washington Post's website. How much longer will we ignore the signs of a climate in crisis? Why are only two Virginia representatives sponsoring climate action legislation in the U.S. House? What are Tom Davis and Frank Wolf waiting for? A category five to come up the Chesapeake Bay? Or to come ashore at Virginia Beach? Senator Warner is poised to end his nearly 30-year Senate career tackling the biggest challenge of our time: global warming. This year, Senator Warner has taken a leadership role to advance legislation to address global warming as a national security priority. He has recently outlined a bi-partisan proposal with Sen. Joe Lieberman (I-CT) that would reduce the pollution causing global warming and provide resources to help protect the Chesapeake Bay and other fish and wildlife habitat from climate change. The two senators lead a Senate subcommittee that can advance action on this critical issue this Congress. No topic splits environmentalists right now like the Warner-Lieberman bill being drafted in the Senate. Some groups are hopeful Warner-Lieberman will be tough enough that it's worth supporting, while others think Warner-Lieberman will be so soft it deserves to die in committee. They want the bill sponsored by Sen. Barbara Boxer (D-CA) and Sen. Bernie Sanders (I-VT) -- the toughest bill in the Senate -- or nothing. Warner could be the key to getting a bill out of the Senate Environment Committee, where Democrats hold only a one-vote edge. He comes from state where, it's safe assume, there are strong, conflicting opinions about climate change; the commonwealth includes both coal mines and the coastline along the Chesapeake Bay. But he's also a national security geek, and he has said that he's worried that global warming could lead to environmental refugees and political instability. Meanwhile, to deal with fears that carbon caps will damage the economy, four Senators -- Republicans Warner and Lindsey Graham of South Caroline and Democrats Blanche Lincoln of Arkansas and Mary Landrieu of Louisiana (the land of oil & gas & Katrina) -- introduced legislation that would aim to protect consumers and business from the potential costs of carbon regulation. Open Left's Matt Stoller has offered the most stinging criticism of Warner-Lieberman (thanks to Lowell for the tip). However, I'm not sure how Matt can say "it's a terrible legislative package coming to the floor in the fall" when we don't know all the details yet. Some environmentalists counter that it doesn't matter which bill comes up for a vote -- President Bush will surely veto any serious global warming legislation and the Senate doesn't have enough votes to override -- it's the roll call itself that matters. Force all one hundred senators to go on the record on a serious bill. No more equivocating. Do you recognize the settled science or are you an unrepentant denier? Then the voters can be clear about their choices in 2008. 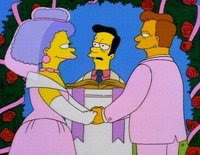 But Matt is right when he says, "We get one bite at this apple." If soft legislation passes and we try to firm it up later, Republican climate change deniers will say, "See? We told you so. They won't be satisfied until the economy is crippled."